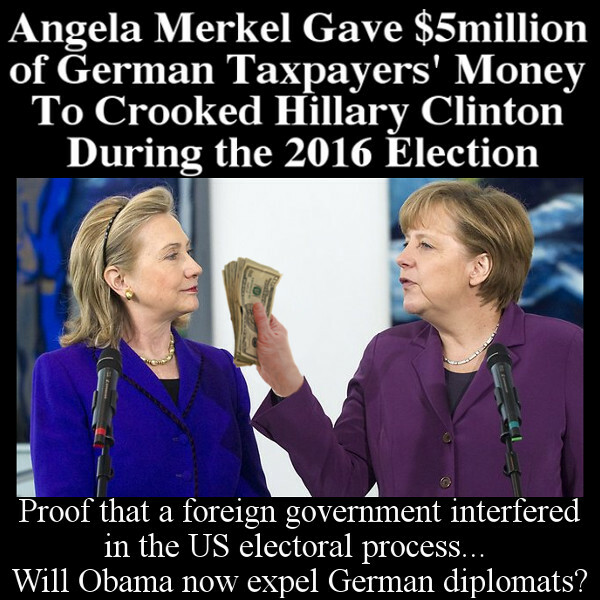 Angela Merkel gave some $5million in German taxpayer funds to Hillary Clinton's illegal slush fund to help re-elect her. This is clearly direct evidence of a foreign government interfering in the US Electoral process and an attempt to influence the outcome of the 2016 election. President Obama has acted swiftly and immediately expelled German diplomats from the country and will announce new sanctions. Hillary will be forced to return the money and will be put on trial for this clearly illegal scam. Five mil? That's it? That'll barely buy an hour of TV airtime. I guess Merkel needs real money to build "refugee" housing in her own backyard. the bottom of her Foundation Barrel and donate a dime to Die Große Vorsitzende! That was in summer 2013, a few months before Election-2013. By then, Merkel had just one big-scale disaster on her hands : the post-Fukushima "Energiewende" in spring 2011. The background was transparent : (a) massive (Germany here!) nuke-hysteria, MSM & polit-Green driven, plus (b) obvious maneuver of Merkel/RINO to grab the "green-do-good" mantle (with "masses" heavily behind it), while nullifying the Green Party in the process (all that with an eye on 2013, election year). Both (a) and (b) worked smoothly out. Technically, a classical case of never let a "crisis" go to waste. In a jiffy, the long-term plan of phasing-out nuke plants (within 30 years) and contracts with nuke energy industry went to the basket, willy-nilly reduced to 12 years. And "wind+solar" declared as the New Energy, gigantic subventions etc. written in law, mass enthusiasm "vee vill be Weltmeister in solar! and wind! ", CO2 killed, Climate saved, energy engineers and economists barely consulted (except a handful yea-sayers), and quite a part of the public stunned, in disbelief. In short, an idiocy ab ovo. Come 2013, and only the (tactical) Energie-albatross around her neck, Merkel cut quite a figure ‒ compared to veritable zeros of other candidates. She won overwhelmingly (and understandably). The narrow-minded, partially stupid, and dictatorial persona, committing serial breaches of national and EU law (extra-legal bailouts of Greece, all in vain), that was barely on a misty horizon. To say nothing of the truly historic, single-handed idiocy of "Refugees Welcome", in 2015. It blew up on REDDIT too.